The 300 bones of the giant skeleton have been painstakingly pieced together for the exhibition. A 39ft Tyrannosaurus rex is ready to be unveiled on the only UK stop of its European tour. Experts have spent three days piecing together the 300 individual bones that make up the skeleton, which will be on display at Kelvin Hall in Glasgow from Thursday. The skeleton is on the T.rex in Town tour while her museum in the Netherlands is being redeveloped, and she has been viewed by more than one million people across Europe. Edwin van Huis, director of Trix’s home museum the Naturalis Biodiversity Centre in Leiden, said: “We are thrilled that Trix is in Glasgow and we are very excited to show her off to Scottish and UK audiences. “This marks the final stop of Trix on her European tour before she returns to the Netherlands. “Trix is loved by the Dutch people and is an ambassador for us as a museum, which aims to inspire children and adults about the natural world. “It is fantastic the people of Scotland can also admire our queen of dinosaurs and be astonished by nature. The skeleton was discovered in Montana, the US, in 2013 and is described as extremely well preserved, with almost 80% of her bones found. The exhibition is organised by The Hunterian at the University of Glasgow along with Glasgow Life and Naturalis. Time-lapse footage has been released to show the complexity of work to piece together the skeleton, which is housed in a bespoke, climate-controlled pavilion within Kelvin Hall. 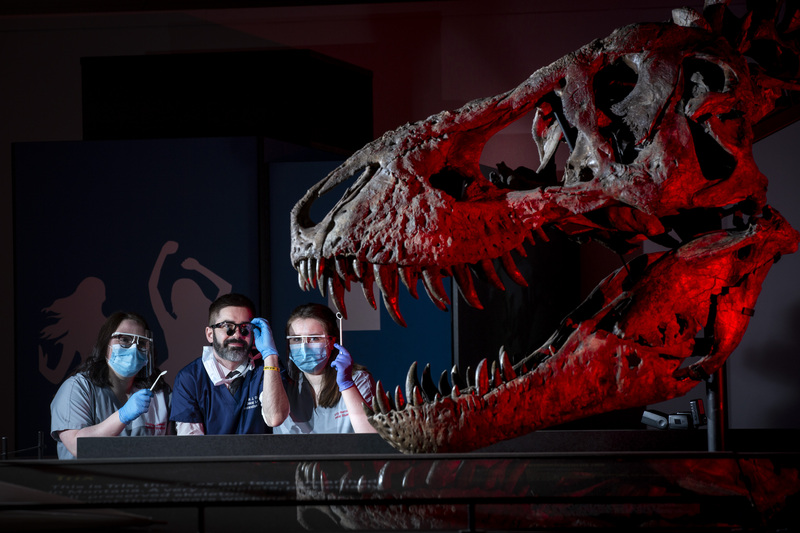 Steph Scholten, director of The Hunterian, said: “T.rex in Town offers a once-in-a-lifetime experience for visitors to come face-to-face with a real T.rex and learn about her life through this superb interactive exhibition. Trix will be on display at Kelvin Hall until July 31.